Model 302 is our entry grade vacuum tube amplifier. 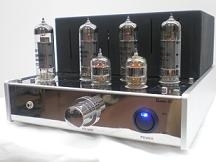 To provide stereo 6 Watts power output, six pieces of vacuum tubes are used. Despite of its compact size, Model 302 provide stronge enough power to drive most loudspeakers in any venue. This item was an OEM model for a famous Japanese brand. We have limited stock in discount rate. Stock items might have inconspicuous minor scratches. I strongly recommand Model 302 to any new vacuum tube user and this discount rate will not be seen again upon stock finished.